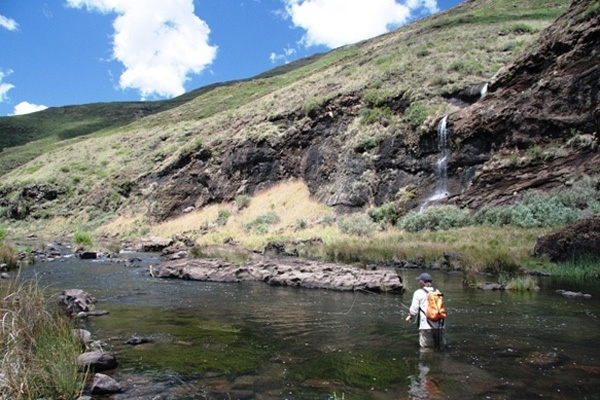 This November, while guiding a couple of guys on highland mountain streams in Southern Africa, we came across a flying ant fall, this changed the course of the days fishing dramatically. We had begun fishing around 9 in the morning and because the water was high and the skies were slightly overcast and no fish were feeding off the surface we started prospecting with nymphs. 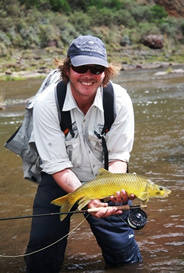 Nymphing is often the only real successful or productive method to target fish that feed off an abundant living drift, (living drift is the down-stream drift of invertebrates that for some reason, have lost their hold on the river bottom and are swept down the current to ultimately become fish food.) In fact nymphing can be so productive that even the most well ‘fed’ fish in a natural stream will not refuse an imitation when fished correctly. This day seemed no different from any other and we caught numerous Rainbow trout and a half a dozen large smallmouth yellow fish on nymphs. By lunchtime most of the cloud cover had burnt off and a slight downstream wind developed. Fish started rising on the odd occasion but we could not make out what they were feeding on as no insects were coming off or floating on the water surface (or so it appeared). I changed my clients’ nymph set-ups to dry fly rigs and we caught and missed a couple of the rising fish on terrestrial patterns such as floating spiders. What we did not realize was that a flying ant fall was happening a couple of hundred meters upstream in the direction that we were fishing. A few ants (that were hard to see on the water surface) had already started drifting down and this is what the fish were occasionally feeding on. As we fished up-river the rises became more intense and the fish rising, larger. We stared seeing mating flying ants in small clouds above us. The queen ants were large, black and dark brown bodied with enlarged shiny abdomens while the males were less than half their size, blacker in colour and a lot slimmer. Some of the ants had fallen on the water whilst still attached in mating mode, making the meal for nearby fish even more irresistible. 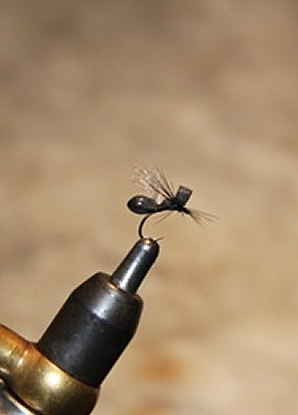 I tied on a larger black floating, flying ant imitation on relatively long tapered leaders attached to 4X tippet. The 4X tippet may sound like a slight over-kill but the fish were big, strong and were too frenzied to be tippet shy. The nature of the smaller trout was to lie in one spot waiting for the ants to drift onto them while the Yellow fish and larger trout would swim around in larger pools frantically gulping up the ants. The yellow fish would often turn short of the ant, creating a splash with their tails as they turn, so close to the ant that it would ‘drown’. The yellow would swiftly return to collect the now, sub-surface meal. The moving fish can make life difficult, under these circumstances, for an angler who may struggle to accurately present flies, but patience is rewarded. 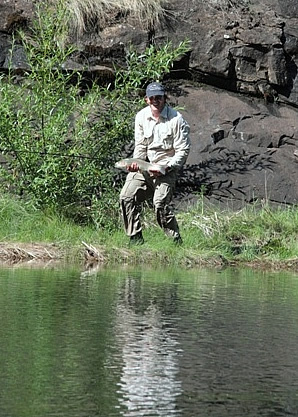 We found a healthy wild trout of about 20’’ cruising off the current, feeding wildly. One of the guys with me presented a flying ant imitation that fell well behind the fish. The fish continued feeding away from the fly and after a couple of gulps disappeared. The presented fly was still drifting on the surface when the angler turned to me asking if we had spooked the fish. At that moment, as Murphy would have it, the trout reappeared on the surface, gently sipping the imitation off the top. I shouted ‘yes’ as the fish disappeared and the angler instinctively struck, fortunately setting the hook. Two lessons can be learned from this: 1. 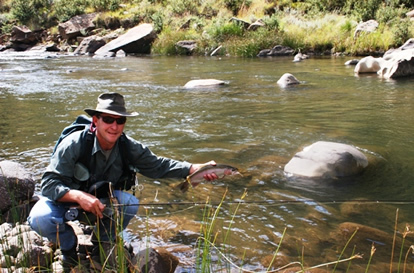 Never take your eye off the dry fly or strike indicator that drifts on the water and 2. 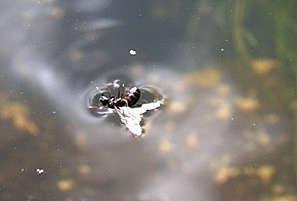 When there are flying ants on the water surface fish don’t often stick to lies or their usual patterns. As the fish felt the hook and line tension it dove straight down into the natural water grass of the deep pool and imbedded itself. The angler had no choice but to swim in after it, not touching ground but eventually managed to free the fish and continue the fight. A couple of pools further upstream and a number of fish later we found a yellow fish female in a riffle lazily sipping ants off the surface. She was quite large but had no other apparent competition. It was amazing to witness such a large fish methodically feeding of the surface. Unfortunately we spooked some Yellows from the pool below the riffle and they shot up-stream alerting the big fish, pity because she would have been special on a dry fly. Flying ants or ants that fly and land up on the surface of the water are like manna from heaven to both indigenous Yellow fish and trout. This phenomenon which we anglers call an ‘ant-fall’ is seldom witnessed as it does not happen often. When however it does happen, fish will greedily react to the fall and will be on high alert, often lying close to the water surface to sip up the protein source that helplessly float down-stream. Most ant species fly and the bigger the ant the more spectacular the reaction to the fall. Predatory birds are often attracted to the feast and are a tell tale sign of the event. The ant colonies do not communicate the flight but simply react specifically to temperature, humidity and wind speed. Queen ants emerge from their nests and begin their nuptial flight with the smaller males in pursuit. Some queen ant will fly long distances but others only a couple of meters from the nest. They mate in the air after which they fall to the ground and lose their wings and attempt to start a new colony. The flight is called the nuptial flight and many colonies of the same species can turn to flight simultaneously to minimize the effectiveness of predation. This collective flight between many colonies of the same species will ensure that new colonies are formed and that old colonies have an injection of new blood ensuring its survival. Many of the ants from both genders land up in the water, especially when losing focus during the mating process. 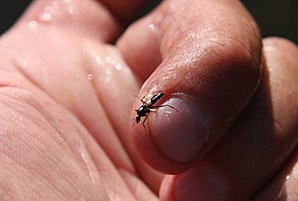 Flying ants are bad swimmers and once their wings get sucked onto the water surface they are doomed as the insect is too weak to lift them out. I have often rescued individual ants from the water surface, for inspection, and as soon as they dry and become mobile they fly away. Flying ant imitations have been around for ages and have saved many a day on the waters. Fish that are rising to floating ants will often not react to any other offering. This can be frustrating to the ill prepared fisherman. I always carry a handful of floating ant patterns in different shapes and sizes, with and without wings. Travelling without flying ant patterns in your fly box is like going on a fishing trip with a medical kit that has no Imodium, you don’t often need them but if you do then you need it bad! I have witnessed a dozen or more ant-falls in my life that have been close enough to the river to cause the ants to land up helplessly on the water surface. The larger fish in that specific river often awaken from their steady side-to-side nymphing mode and move into the upper water column to intercept the ants. Once many years ago, four or five large fish fed so frantically on flying ants off the surface that from a distance they appeared to be otters rolling and playing on the water surface. Only when I moved closer could I make out the large trout feeding on the flying ants and what an amazing sight!